Touring Asia and playing cricket in hot and humid conditions and on dry and turning pitches has never been easy for any South African player. That is exactly what the South African team will have to do for the next month and a half as they begin a gruelling tour which includes 2 test matches, 5 ODIs and one T20 match. Sports bettors in South Africa have had a great time wagering on the 2018 FIFA World Cup. As the World Cup comes to a close, they now have a chance to switch from football to cricket and back the Proteas as they look to overcome the Lankan Lions. South African captain Faf du Plessis will most likely go into the first test with the usual bowling line-up that includes three seamers and one spinner. Most teams switch to two spinners when they play in the sub-continent but South Africa have more confidence in their fast bowlers than their spinners. Dale Steyn is back into the Proteas squad after a long layoff due to injury. He along with Vernon Philander, Lungi Ngidi and KG Rabada will make up the attack. That is a fierce attack on fast pitches but less daunting on the slow and turning pitches of Sri-Lanka. K Maharaja will be the lone spinner who will have a lot of responsibility on his shoulders. South Africa have played test cricket for a couple of years without AB Devilliers who was out due to injury. Their star player made his return to the side when Australia toured recently and showed why he was tagged as their best batsmen. He is now officially retired from all formats of the game and South Africa will look to fill the void for good. 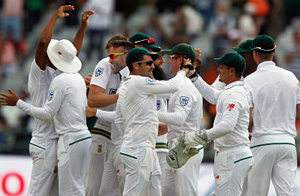 The Proteas know that winning the first test is vital in them getting the upper hand over a Sri Lankan side that is in rebuilding mode.